A water-loving plant, Mexican primrose-willow has exploded in the weeks since Hurricane Harvey. Its pretty yellow blossoms and red stems are unmistakable, but here one of its still-green buds serves as a setting for a gem of a dewdrop. After so many weeks of muddy water and silt, even a single drop of clear, reflective water can bring joy. Water lovers are in their element. Me? I’m ready for a little dry-up, though I always say that quietly. Here in Texas, if you wish the rain away, it may just happen! Love the photo! As much as I’ve enjoyed the cleansing effects of our recent rains, and as much as I’m enjoying the sight of a little clear water, I’ll join you in wishing for dry weather. I wasn’t at all pleased to discover the Hurricane Center muttering about the possible formation of another storm. Enough, already! We need a little cool, crisp autumn. How apropos: drops are coming down in Austin as I read this post. Here’s to clarity. We’ve been having off and on rain, too, and tides so high that many of the docks have been under inches of water. The good news today was that I could see my toes as I barefooted through it. Here’s to clarity, indeed. Love the title of this. I wonder if there ever was a hurricane named Mighty Casey? (Just being silly) Nice photo too with its one drop of dew. Hooray for you, Kayti! I knew someone would get the title reference — all silliness happily accepted. I love the thought of a Mighty Casey hurricane — as long as he strikes out, of course. It was worth getting up to capture that drop of dew. These flowers close at night, and I wanted to get a photo of a just-opening flower. In order to do that, I had to get up at dew-thirty, but this was a fine reward. I’m glad you like it. You know me and baseball! How apt for the primrose willow to show its dewdrop. The world’s full of tiny treasures, isn’t it? Believe it or not, this is a plant we share. It can be found in Australia in several locations. If you scroll down on the linked page a bit, to the section titled “Distribution and Ecology,” it lists the various areas. It’s wonderful and comforting to watch nature going through the beautiful process of renewal. Isn’t it, though? We’ve had enough rain now that much of the mud and natural debris have washed away. Increasing numbers of flowers are blooming, the bay is starting to salt up a bit, and when I walked out tonight, it smelled fresh and green for the first time in weeks. It’s almost like a second spring. For all the destruction, there is life — and the new life sheds a tear for what was as it prepares to be the new life. Beautiful image, Linda. What a lovely vision, Jeanie. And it’s true, isn’t it? We can continue to grieve the old, even as we’re building the new. Until your comment, I hadn’t seen this as a teardrop. It’s a nice reminder that there’s always a new way to see an image. You couldn’t get a gorgeous shot like that up here in the flatlands — mostly because it’s too dry up here for Mexican primrose-willow, but even if you could find some, and could rustle up enough humidity for there to be dew, it’d be too windy. . . . I wasn’t sure I could get this shot, either. The drop of dew was so large I thought gravity might kick in before I could get low and stable enough to make it work. As the saying goes, sometimes it’s as important to be lucky as good — and I’m quite happy to accept a little luck from time to time. Magnificent photo. I love it. Well worth the effort of early morning rising from a comfortable sleep. I thought so too, Yvonne. I thought about our favorite sunrise photographer as I was heading back to this particular shrub, that happened to be an hour away. I’m not sure I’ll ever be as dedicated as he is, but I will say that early morning has its pleasures — especially now that sunrise comes at 7:00, and not at 5:30. Can a single droplet balance the force of an irrepressible, mud-filled torrent? Why, yes. Yes, it sometimes can. Water, water everywhere and only one drop to drip, eh Linda? Now, that’s clever, GP. Anytime we can bring both the Mighty Casey and Coleridge to a party, it’s bound to be a good time. Chaos and destruction always get more press than rebuilding. There’s nothing very exciting about pulling out sheetrock or watching heavy equipment carrying away piles of debris — unless it happens to be your sheetrock they’re finally getting out of the front yard. There are a lot of people who still are dealing with terrible situations, and a lot of people who get very nervous when it starts to rain, but on the whole, we’re doing well. I did hear that Hemingway’s house in Key West survived with minimal damage, and that the cats are fine. Sloppy Joe’s is open, and Capt. Tony’s was scheduled to reopen this week. Who cares about the Hog’s Breath when you have places that can inspire songs like this? I think only you can make us laugh in the face of rebuilding after a disaster – way to go!! I thought Texas was all about mountain dew & aguardiente! This is such a cool shot and neat to actually see colors in the droplet. And another plant that’s new to me. I’d never heard of aguardiente, and had to look it up. Mountain Dew? I’ve never tasted it, and don’t remember seeing it at any gatherings: urban or rural. Margaritas on the rocks? Tequila shots? Great craft beer from St. Arnold, like Weedwhacker and Pumpkinator? Now you’re talking. Those colors are neat, aren’t they? I’ve got two more images of it in different stages, but I thought each deserved their own post. I looked it up, as I figured from the name, your plant doesn’t come this far north, but there’s some varieties of primrose-willow in NY, although not in my county, but I’ll keep an eye out for it now when I’m near marshy areas. I’ll look forward to pics of different stages. Glad you’re enjoying kind of a second spring after the big storm. Your Ludwigia (L. peploides) is quite similar in appearance. Ours has four petals; yours has five. The leaves differ a bit, and the stamens aren’t quite the same, but they’d be recognized as kin. Best of all, even though a common name for yours is creeping primrose-willow, it’s not invasive. Enjoy! Linda, you must have the patience of Job, waiting for the exact second when that dew drop was just about to fall! Brilliant capture, my friend. Of course, we don’t have Mexican primrose-willow here — as dry as things have been for the past month or so, it would never have survived! Debbie, I didn’t have to wait. I found it like that: just hanging. The trick was getting the photo before it fell — something I wasn’t entirely sure I’d be able to do. But now and then things work out, and among a dozen or so not-so-good images, I found this one, and was satisfied. I hate that you’re still so dry. I see there’s rain moving into St. Louis. Maybe it will hold together, and help you out a bit. I hope so — it would be nice for you to have some leaves that don’t just wither and die instead of turning colors. The grass is brown, the leaves are curling and falling. It’s not one of our prettier Falls. I suppose it’s been good for the farmers who are working feverishly to get their crops in. The weather folks have assured us we’re supposed to get rain off and on most of this week — so far, I think we’ve had less than one-half inch. Not near enough, I’m sad to say. The plants are really relishing the sun’s altered angle and heat. I gave my Cape Honeysuckles to a friend because I just didn’t have enough sunlight for them. They quit blooming in the heat of the summer, but now they’re back at it, thanks to that lower angle and lesser heat, and the hummingbirds are swarming. She’s thrilled to death, and so am I.
I took this photo down at Hall’s Bayou, in a field near the fishing camp. I can tell you this: there are a lot of early rising fishermen in this world, all looking for their own little miracles. Little by little, things are improving for them, but as one said, even if there wasn’t a single fish to catch, he’d be out there anyway — just to be out there. I forgot to mention that they’ve got a great live tracking map for Harvest Moon this year. You can see it here. I’m cheering on Patriot, who’s one of my customers. IDF the hummingbirds are going, of course the sailboats must. Flyers swoop on! The ability of life to regenerate always amazes me, Linda. And there is promise in that. We don’t need to wait for large-scale disasters to witness that regenerative ability, either. Every cut, scrape, burn, or bruise witnesses to the body’s ability to heal: a miracle all on its own, and a token of the larger-scale healings that are happening around us every day. As for being “desensitized,” that’s a word I’m cautious about. A person in the midst of watching their life wash away isn’t going to care about what’s happening in West Wherever. That’s not callousness or insensitivity: it’s a natural and appropriate response. Even under what passes for normal circumstances, there’s a huge difference between, for example, informed engagement and the kind of obsessiveness we see on social media. Facebook arguments and Twitter wars may be emotionally satisfying, but they’re not proof that the combatants care more about the issues at hand than those prefer to deal with them in less public ways. The truth is, the world always has been a rough and complex place, but we weren’t at the mercy of media outlets dedicated to keeping us stirred up all day, every day. The human psyche isn’t made for such things, and to one degree or another, desensitization may be nature’s way of protecting us. It’s something I think about, anyway. I like your idea about desensitization. But I am very glad Nature doesn’t let us become desensitized to the beauty of a dew drop. When I read your comment in the email, the word “oblivious” came to mind in a flash. There’s a distinction worth making, I think. 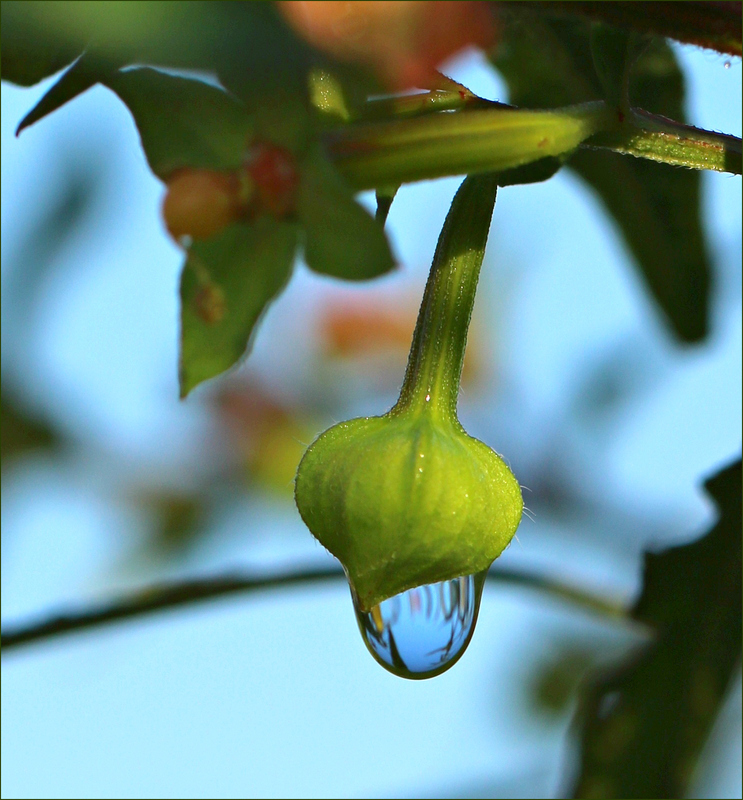 Some people would be oblivious to that lovely dew drop; they wouldn’t see it at all. Others might have it pointed out, but think it worthless, or silly, or ordinary. They’d be insensitive to its beauty. There’s no question that many people today are oblivious to what’s around them. They might not be insensitive at all, but only need someone to point out life’s wonders,. The big, bad events always are going to get noticed. The lovely little ones? Maybe not so much. Ah, yes, I was so caught up in the dew drop, I was oblivious to these distinctions. Either that or it’s past my bedtime and my brain is fading. :D A lovely post to read just before I retire to bed. Thank you. I think “oblivious” was the word I was searching for last night, but my own brain was fading. A nice morning and a cup of coffee brought it back. Ditto. Just finished my morning coffee, the sun is shining and I am ready for whatever adventures the day brings. I certainly understand being glad that the media has moved on, Linda! Media attention can be valuable at times, especially in depth coverage of an issue, or when coverage means that problems are addressed that might otherwise be ignored. But Cable News isn’t designed to provide such coverage, and the need to generate numbers almost always leads to sensationalism. I did think that the media focus on Puerto Rico helped. Fires in the West received close to zero media attention this summer because of the other major natural disasters. Lack of attention means lack of resources. Lots of things burned that wouldn’t have with out more support. Our fire crews told us that they could have put out the fires threatening our area much more quickly, had they had enough firefighters. But the fact, it seems to me, is that our nation needs to be more focused on dealing with natural disasters as a general rule. It always seems easy to get more money for the military. But we need to ask where the limited funds we have best focused to benefit the majority of the people. Have you ever heard the old song of the American West called “Cool, Clear Water? Your comment brought it to mind, and now that I’ve listened to it again, I’m thirsty! An interesting side note: in Liberia, “cold water” can mean either “a gift to soothe ruffled feelings, to appease anger, or to ask forgiveness” or “a small bribe.” Context is everything. I’m glad to see it, and I bet you were reveling in that. The blue in the distance is equally a revelation – what a color! have a great weekend! Isn’t that blue lovely? It doesn’t seem at all washed out to me; I’m not sure what term I’d use for it. Aquamarine, perhaps — a color that rarely shows up in nature, except in certain waters. It’s been a bit of a frustrating and fragmented week at work. I’m looking forward to the weekend, no matter what it brings.